From the makers of Nag Champa! Another wonderful fragrance from Shrinivas Sugandhalaya. 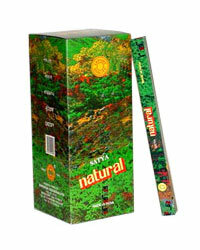 This incense is Masala based (soft and moist) like Nag Champa with a different aroma. Each of the hand-rolled incenses from Shrinivas Sugandhalaya has its own unique fragrance, evoking a subtly different mood and yet all are somehow related. Try them all! If you like Nag Champa, you will love this incense.